I want to write about how this is a great Thanksgiving / Holiday dress because of the empire waist and pleated skirt that disguises overeating, but all I can think of is that episode of Friends where Joey borrows Pheobe's maternity pants to eat dinner. If I recall correctly he called them his "turkey eating pants". So, this is a good turkey eating dress. JD gave it to me as a birthday present a couple of years ago and it has steadily been one of my go-tos for holiday dressing. The material is thick and warm despite the short sleeves, while the herringbone pattern and black piping make it more interesting. This time around, I kept things simple with black suede heels and my current favorite sparkly necklace. Once the holidays roll around I seriously cannot get enough of this necklace, I want to wear it with everything. What is your holiday go-to? haha this is the chicest Turkey Eating Dress ever! 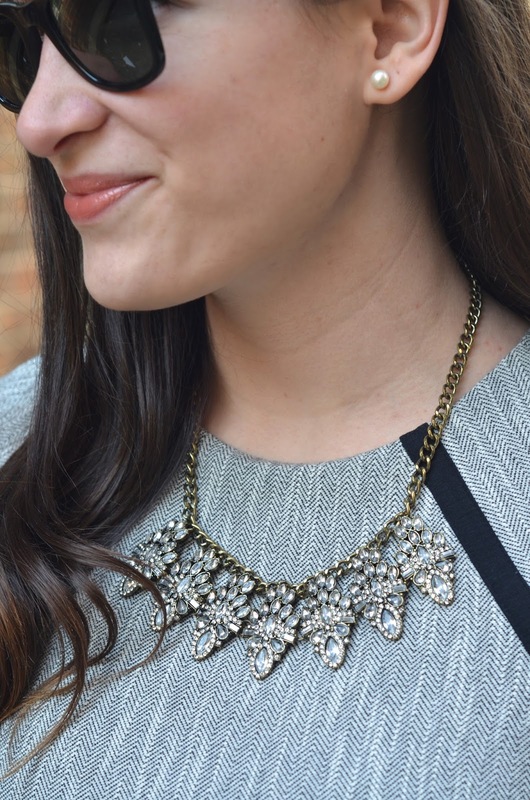 I love the subtle pattern and that necklace is the perfect sparkle! Love the dress! Just perfect. You look fab! gorgeous dress! great statement necklace you paired with it! That's so funny, this dress is gorgeous! Doesn't look like a typical "turkey eating dress" ;-) Love it! I love this dress- it is perfect for the holidays! that dress is so pretty, i can definitely see why you pull it out for the holidays, chic understated class! the friends thanksgiving episodes are some of my absolute favorite. my sisters and i always quote the one where rachel makes dessert and everyone pretends to eat it! Love a dress that can hide any and all holiday overeating! Cute outfit! Ha, empire waists definitely work well for overeating ;) I really like the tweed & sparkle mixed together. I kind of wish we dressed up like this for Thanksgiving but in my family it's always jeans and sweaters. Last year I wore a skirt and everyone asked me why I was so dressed up. Seriously. Love this chic, classic look! That dress is perfect on you. I'm a huge fan of herringbone! It's so classic and timeless. Loving the empire waist (comfort is key) and those Via Spiga heels are perfect!